In that brief headline, and subtitle, we have, in short, a journalistic ethos that is both narcissistic as it is adolescent – demonstrating a media elite who don’t allow themselves to be burdened with such quaint notions as citizenship and responsibility. Whether or not such leaks – classified diplomatic communications from U.S. diplomats abroad – harms national security or endangers lives are questions the likes of Jenkins clearly are not burdened with. No, Mr. Jenkins, not everything said or done in the name of democracy is of public interest. In the real world, free, democratic nations are engaged in serious battles (militarily and diplomatically) with very real enemies – closed totalitarian regimes (like Iran, N. Korea, Syria, and China) – who, by their very nature don’t have to worry about their own state secrets being revealed, and can (and do) use such asymmetry to their advantage. It is sad that journalists such as Jenkins likely would snicker at the notion that patriotism should play a role in their decision-making. However, while responsible journalists in democratic nations should rightly view their job as investigating, and reporting on, the truth in all matters relating to the public interest, such an admittedly noble ideal must also, at the end of the day, be balanced with their responsibilities as citizens of the country in which they live. It’s not called “selling out.” Its called being a responsible adult. So far the information seems relatively harmless – nothing much there that you wouldn’t expect, apart from some gossipy bits about world leaders. But there are apparently 15,000+ “secret” documents to come at some point, and that may be where the real trouble will be caused. When all is said and done, they reveal the corruption that is part and parcel of dealing with the world’s unsavory politicians, which is most of them. Interesting piece here on how it is possible that Wikileaks gave the documents to the Guardian who in turn gave them to the NYT. Who are the grown-ups, acting responsibly to prevent harm? Quis custodiet custodios ipsos? You don’t assist in the breakage when a fragile piece of china falls and afterwards bewail its falling. You attempt to catch it and prevent the disaster instead. Is it morally responsible for journalists to publish classified Palestinian state secrets – because it would help Israel’s national security and protect Israeli lives. Is it morally irresponsible for journalists to publish classified Israeli state secrets – because i it would harm Israel’s national security and endanger Israeli lives. stop clicking on the websites of Wikileaks endorsers, if you are subscribers cancel the subscriptions. I’d suggest that that one should be told to the people who the Taliban say they are currently hunting down. 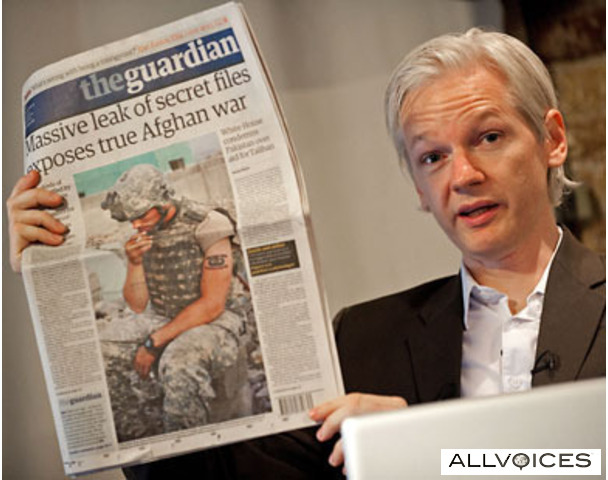 Just because the Taliban may prefer to kill them, if they find them thanks to Wikileaks, out of the public eye doesn’t prove they don’t do it. as to MindTheCrap’s questions: those things are exposed best behind closed doors, where their impact has at least a chance of being controllable. So really this is about embarrassing the USA rather than revealing truth to the proles. Freedom of the press and democratic rule go hand-in-hand. You can’t have one without the other. That said, this latest batch from Wikileaks is a big plus for Israel. Now the world at large knows the Arab rulers have been pressuring the White House to bust up Iran’s nuclear sites. If I had a say in it, I would give this year’s Nobel Peace Prize to the guys who put together the Stuxnet worm. Those fakirs in Tehran didn’t know what hit them. Sergio Bramsole, in a sane world you would be correct. However, the one we’re living in is very far from sane, so I expect there to be a plethora of “cui bono?” comments, followed (some time in the next few weeks) by the general acceptance of the “fact” that the Wikileaks were in fact a Zionist plot to allow those sneaky Jews to foment war (the way we “all know” they love to do). Sorry, I messed up my last comment; I meant to work “psyops” and “false flag” in there somewhere. It’s hard to disagree with your line of reasoning. Albeit, I take great comfort in knowing that effing CIF is not the whole world. Slowly but surely, ordinary people everywhere are beginning to realize that something must be done about Iran’s nuclear weapons program before it’s too late. Israel has clearly won this round, but there are of course more rounds to go in the bout. Is there any truth to what Haaratz is reporting that somewhere in all those memo’s/etc. there is information to the effect that Israel may have notified Egypt and the West Bank as to its plans for Cast Lead and requesting assistance in administering Gaza in the aftermath? I mean, come on, who’s the fall guy highlighted by this “new information”? Am I the only one who finds that a tad too convenient? Very true. I have wondered that the US security services didn’t warn off Symantec from analyzing the worm. The BBC said that the worm has been adopted by criminals AND terrorists and Israel is probably to blame. (Couldn’t they think of something more original to denigrate Israel?). With the ‘sending forward’ of two Iranian nuclear scientists to their 72 virgins, I wonder Time Magazine doesn’t vote Israel ‘Country of the Year’.